Abstract: The anaerobic oxidation of methane (AOM) is a crucial component of the methane cycle, but quantifying its role in situ under dynamic environmental conditions remains challenging. We use sediment samples collected during IODP Expedition 347 to the Baltic Sea to show that relative abundances of 12CH2D2 and 13CH3D in methane remaining after microbial oxidation are in internal, thermodynamic isotopic equilibrium, and we attribute this phenomenon to the reversibility of the initial step of AOM. 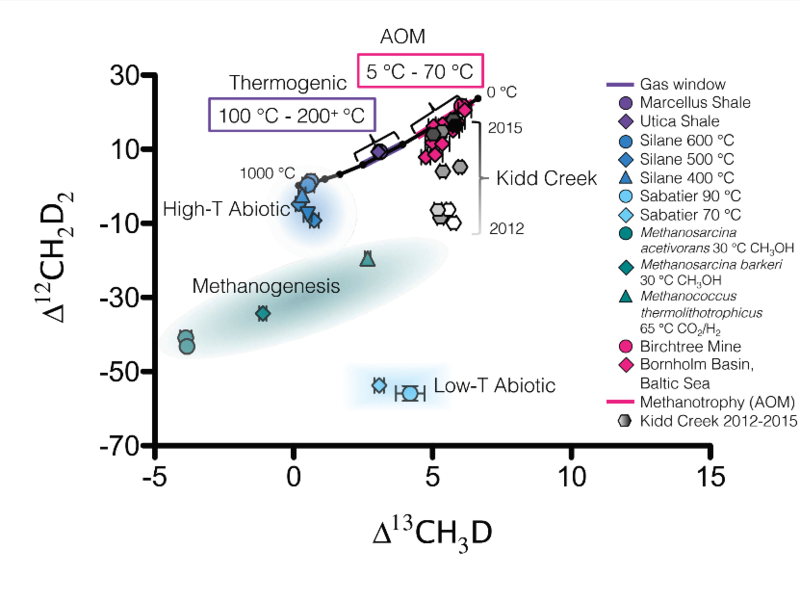 These data suggest that 12CH2D2 and 13CH3D together can identify the influence of anaerobic methanotrophy in environments where conventional bulk isotope ratios are ambiguous, and these findings may lead to new insights regarding the global significance of enzymatic back reaction in the methane cycle. We describe an approach for determining biological N2 production in soils based on the proportions of naturally occurring 15N15N in N2. 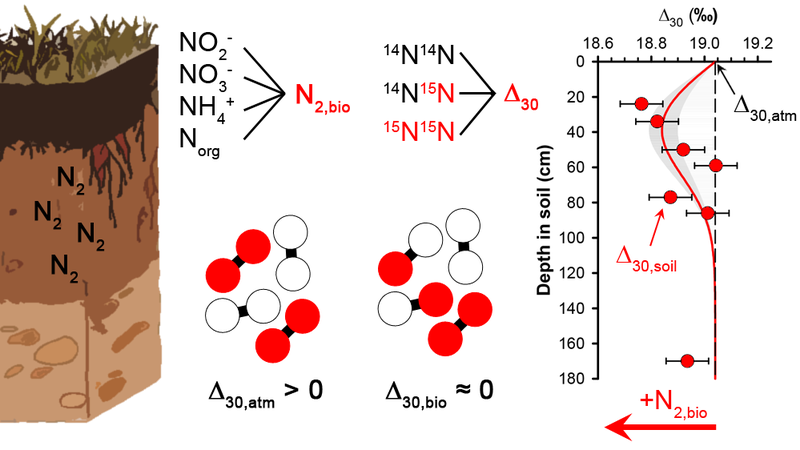 Laboratory incubation experiments reveal that biological N2 production, whether by denitrification or anaerobic ammonia oxidation, yields proportions of 15N15N in N2 that are within 1‰ of that predicted for a random distribution of 15N and 14N atoms. This relatively invariant isotopic signature contrasts with that of the atmosphere, which has 15N15N proportions in excess of the random distribution by 19.1‰. Depth profiles of gases in agricultural soils from the Kellogg Biological Station Long-Term Ecological Research site show biological N2 accumulation that accounts for up to 1.6% of the soil N2. One-dimensional reaction-diffusion modeling of these soil profiles suggests that subsurface N2 pulses leading to surface emission rates as low as 0.3 mmol N2 m-2 d-1 can be detected with current analytical precision, decoupled from N2O production. Nitrogen, the most dominant constituent of Earth’s atmosphere, is critical for the habitability and existence of life on our planet. However, its distribution between Earth’s major reservoirs, which must be largely influenced by the accretion and differentiation processes during its formative years, is poorly known. Sequestration into the metallic core, along with volatility related loss pre- and post-accretion, could be a critical process that can explain the depletion of nitrogen in the Bulk Silicate Earth (BSE) relative to the primitive chondrites. However, the relative effect of different thermodynamic parameters on the alloy-silicate partitioning behavior of nitrogen is still poorly known. Here we present equilibrium partitioning data of N between alloy and silicate melt (DN-alloy/silicate) from 67 new high pressure (P = 1-6 GPa)-temperature (T = 1500-2200 C) experiments under graphite saturated conditions at a wide range of oxygen fugacity (logfO2 ~IW – 4.2 to – 0.8), mafic to ultramafic silicate melt compositions (NBO/T = 0.4 to 2.2), and varying chemical composition of the alloy melts (S and Si contents of 0-32.1 wt.% and 0-3.1 wt.%, respectively). Under relatively oxidizing conditions (~IW – 2.2 to – 0.8) nitrogen acts as a siderophile element (DN-alloy/silicate between 1.1 and 52), where DN-alloy/silicate decreases with decrease in fO2 and increase in T, and increases with increase in P and NBO/T. Under these conditions DN-alloy/silicate remains largely unaffected between S-free conditions and up to ~17 wt.% S content in the alloy melt, and then drops off at > ~20 wt.% S content in the alloy melt. Under increasingly reduced conditions (< ~ IW – 2.2), N becomes increasingly lithophile (DN-alloy/silicate between 0.003 and 0.5) with DN-alloy/silicate decreasing with decrease in fO2 and increase in T. At these conditions fO2, along with Si content of the alloy under the most reduced conditions (< ~IW – 3.0), is the controlling parameter with T playing a secondary role, while, P, NBO/T, and S content of the alloy have minimal effects. A multiple linear least-squares regression parametrization for DN-alloy/silicate based on the results of this study and previous studies suggests, in agreement with the experimental data, that fO2 (represented by Si content of the alloy melt and FeO content of the silicate melt), followed by T, has the strongest control on DN-alloy/silicate. Based on our modeling, to match the present-day BSE N content, impactors that brought N must have been moderately to highly oxidized. If N bearing impactors were reduced, and/or there was significant disequilibrium core formation, then the BSE would be too N-rich and another mechanism for N loss, such as atmospheric loss, would be required. Mantle eclogites are commonly accepted as evidence for ancient altered subducted oceanic crust preserved in the subcontinental lithospheric mantle (SCLM), yet the mechanism and extent of crustal recycling in the Archaean remains poorly constrained. In this study, we focus on the petrological and geochemical characteristics of 58 eclogite xenoliths from the Roberts Victor and Jagersfontein kimberlites, South Africa. Non-metasomatized samples preserved in the cratonic root have variable textures and comprise bimineralic (garnet (gt)–omphacite (cpx)), as well as kyanite (ky)- and corundum (cor)-bearing eclogites. The bimineralic samples were derived from a high-Mg variety, corresponding to depths of ~ 100–180 km, and a low-Mg variety corresponding to depths of ~ 180–250 km. The high-Al (ky-, cor-bearing) eclogites originated from the lowermost part of the cratonic root, and have the lowest REE abundances, and the most pronounced positive Eu and Sr anomalies. On the basis of the strong positive correlation between gt and cpx δ18O values (r2 = 0.98), we argue that δ18O values are unaffected by mantle processes or exhumation. The cpx and gt are in oxygen isotope equilibrium over a wide range in δ18O values (e.g., 1.1–7.6‰ in garnet) with a bi-modal distribution (peaks at ~ 3.6 and ~ 6.4‰) with respect to mantle garnet values (5.1 ± 0.3‰). Reconstructed whole-rock major and trace element compositions (e.g., MgO variation with respect to Mg#, Al2O3, LREE/HREE) of bimineralic eclogites are consistent with their protolith being oceanic crust that crystallized from a picritic liquid, marked by variable degrees of partial melt extraction. Kyanite and corundum-bearing eclogites, however, have compositions consistent with a gabbroic and pyroxene-dominated protolith, respectively. The wide range in reconstructed whole-rock δ18O values is consistent with a broadly picritic to pyroxene-rich cumulative sequence of depleted oceanic crust, which underwent hydrothermal alteration at variable temperatures. The range in δ18O values extends significantly lower than that of present-day oceanic crust and Cretaceous ophiolites, and this might be due to a combination of lower δ18O values of seawater in the Archaean or a higher temperature of seawater–oceanic crust interaction. Oxygen isotopologues are useful tools for understanding biogeochemical processes and chemical budgets in the ocean. For example, the triple‑oxygen isotope composition of dissolved oxygen in the ocean mixed layer (i.e., its δ17O and δ18O values) is widely used to estimate gross oxygen productivity (GOP), a quantity closely related to gross primary productivity. While recent work has demonstrated the importance of upwelling and horizontal transport to these estimates, the isotopic effects of gas exchange when the mixed layer is out of solubility equilibrium have only been measured for 18O/16O. Oxygen is rarely at 100% saturation in the surface ocean, so most regions experience net ingassing or outgassing; kinetic fractionation across the air-water boundary is therefore expected to be important. Here, we present the results of air-water gas transfer experiments designed to obtain the kinetic and equilibrium fractionation factors for the four rare O2 isotopologues 16O17O, 16O18O, 17O18O, and 18O18O relative to 16O16O. Furthermore, we examine their possible effects on isotopologue-based GOP estimates and connect the observed air-water kinetic fractionation factors to dissolved-phase diffusive isotopic fractionation. These kinetic fractionation effects may provide additional constraints on O2 cycling in the surface and deep ocean. Ocean ridges are one of the primary connections between Earth’s mantle and surface. Therefore, understanding the evolution of ocean ridge processes through Earth history is important for understanding how Earth’s surface and mantle have evolved. We combine an analytic model of mantle convection with a petrologic model of mantle melting in the presence of CO2 to compute the mantle temperature, plate speed, melt production, and CO2 outgassing flux at ocean ridges for the past 4 billion years. We explore a large suite of realistic mantle and lithospheric parameters to map out a full range of possible thermal histories. Our results show that in order to satisfy thermal constraints, the Earth must have started in a sluggish-lid mode of plate tectonics and transitioned to an active-lid mode. Furthermore, we show that plate speed and CO2 outgassing flux do not necessarily scale with mantle temperature, and that it is possible to reach present-day mantle temperatures and plate speeds with a simple force balance that does not invoke any feedbacks (e.g. grain size evolution, dehydration stiffening) or a fully stagnant-lid mode of convection in the Precambrian. The solutions show a range of evolutionary behaviors depending on the parameters chosen. The transition from sluggish- to active-lid can be smooth, abrupt, or somewhere in between. A smooth transition is difficult to distinguish from a purely active-lid evolutionary path based on temperature, plate speed, melt production, and CO2 outgassing flux. In contrast, an abrupt transition leads to a large increase in the average plate speed with a corresponding increase in melt production and CO2 outgassing flux. As an abrupt transition would have a much larger effect on CO2 outgassing and melt production than a change in ridge length, we investigate the impact of rapidly changing plate speeds and do not consider changes in ridge length. Finally, we show that carbon recycling is required for a large part of Earth history in order to explain present-day CO2 outgassing. Our model highlights the importance of understanding the style of mantle convection when calculating melt production and volatile fluxes through Earth’s history.